Geena Davis as Morgan Adams. Say “pirate movie” today and the immediate association is the Pirates of the Caribbean series. Some of those films are terrible, but they all made tons of money. Not so long ago, though, a pirate movie went down in history as one of the biggest flops of all time: Cutthroat Island. How bad is it really, though? First, a bit of context. Even before its release in December 1995, Cutthroat Island was surfing a huge wave of bad publicity. After multiple script rewrites left him unhappy with his character, male lead Michael Douglas dropped out and—after a wide and frantic search failed to snag another A-lister—was replaced by the much lesser-known Matthew Modine. This 1995 Los Angeles Times article gives way more detail on how and why that happened; it features an unapologetic interview with Cutthroat Island director Renny Harlin, who was married to the movie’s other star, Geena Davis, at the time. Twenty-three years later, it’s a little easier to shove all that baggage aside and consider the movie on its own. You’re flipping through titles, looking for something to watch to pass the time, and Cutthroat Island pops up. 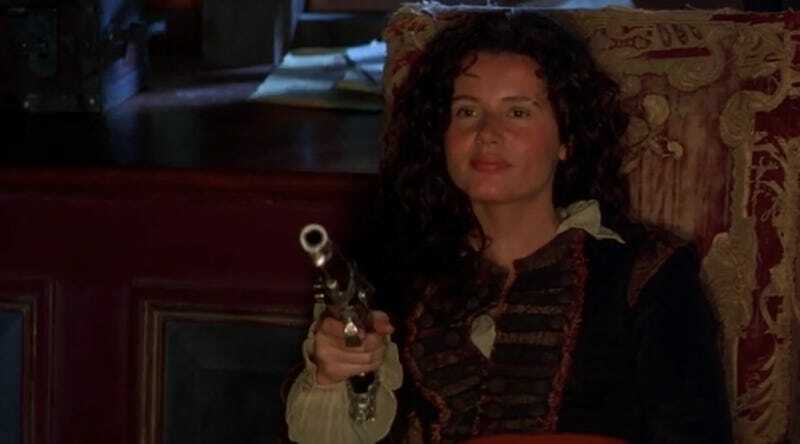 Geena Davis as a lusty, rum-chugging, sword-swinging pirate captain? Sounds promising, doesn’t it? All it wants is to be an old-fashioned swashbuckler with a little comedy and romance thrown in, with the added novelty of having a tough female pirate—Morgan Adams, played by Davis—at the center of its adventure. And, honestly, despite some rough edges here and there, it mostly succeeds. Though the story and screenplay have six credited writers, Cutthroat Island doesn’t break too much new ground. (That committee of scribes did manage to come up with some very corny dialogue, however.) The main plot is a race to capture buried treasure, with revenge and assorted double-crosses folded in along the way. There’s also a budding flirtation between Morgan and a con man named Shaw (Modine, whose take on the role is a bit goofier than Douglas’ probably would have been), as well as twin villains in Dawg Brown (Frank Langella), a pirate so cartoonishly evil his ship is named the Reaper, and the corrupt, bewigged British governor of Jamaica (Patrick Malahide, who went on to play Game of Thrones’ Balon Greyjoy). Also, there’s a teeny trained monkey named King Charles. In that Los Angeles Times article mentioned above, the head of marketing for MGM—which distributed the film, even though Carolco made it—optimistically points out that “every penny spent is up there” on the screen. And he’s not wrong. Cutthroat Island runs just over two hours, and a huge chunk of that time is given over to elaborate action sequences that go on and on, as when wanted criminal Morgan is spotted in Jamaica (not a shocker, considering her “posh gentlewoman” disguise is hilariously conspicuous) and escapes only after an epic horse-and-carriage chase that ends with cannons obliterating the town’s waterfront. In her 1995 review of the film, New York Times critic Janet Maslin opined that “The only serious incentive for seeing this spectacle is a fascination with extravagance, since Cutthroat Island is indeed scenic, hectic, and big.” Maslin wasn’t a fan of the movie, but that extravagance she mentions is actually even more fascinating in 2018—because the film was made without the benefit of today’s sophisticated digital effects. Those explosions that Harlin is so fond of? Presumably, that’s real fire up there on the screen; whatever it is, it’s definitely more scorching than the blah chemistry between Davis and Modine. Davis and director Renny Harlin went on to make the Shane Black-scripted The Long Kiss Goodnight together, then got divorced in 1998. For my money, that’s the weakest part of the film; Davis is badass as Morgan, and Modine is adequately rakish as Shaw. But there are zero sparks between them, and you have to wonder why the writers didn’t just reshape the Shaw character entirely once Douglas quit and took the movie’s original aspirations of being a pirate-themed spin on Romancing the Stone with him. Why not just let Morgan, backed by her small gang of loyal men, go about her treasure-hunting without any romantic entanglements? Why not go even further and add a few more substantial roles for other women into the story? That may be so, but Cutthroat Island still manages to be entertaining in spite of everything, and that includes its overlong running time. It’s about pirates! There are sword fights! And cannons! And treasure chests full of gold doubloons! A swaggering Geena Davis is delightful, and Frank Langella—the only person in the cast who seems to be winking at the camera—is clearly having a good time with his oversized character, despite whatever chaos was going on behind the scenes. And did I mention the trained monkey? If you didn’t know the whole backstory, you’d never, ever guess that this bombastic, eager-to-please pirate adventure was a financial disaster that became a show-biz punch line. 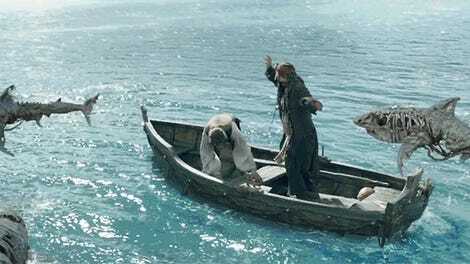 It’s definitely worth a re-watch, matey.